Review posted July 1, 2018. Flatiron Books, 2017. 240 pages. I believe part of my calling on Earth is to help people connect to ideas that expand their vision of who they really are and all they can be. That’s why I created Super Soul Sunday. After filming more than two hundred hours of heart-expanding interviews, I began to envision a truly transcendent book – with words you can hold in your hand, be inspired by, and carry with you forever. The result is a lovely book. Oprah takes excerpts from interviews with many different distinguished guests with whom she’s discussed things that really matter. 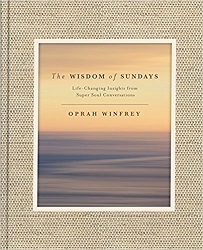 The conversations are printed with a backdrop of photos, many of which were taken at Oprah’s home in Santa Barbara. They remind me of the photos I take near my own home, spotting small moments of beauty. The general topics she covers are Awakening, Intention, Mindfulness, Spiritual GPS, Ego, Forgiveness, Broken Open, Grace and Gratitude, Fulfillment, and Love and Connection. It won’t be a surprise that things get new agey, and there are leaders from several different religions represented here. I didn’t agree with every single word – but there are many beautiful nuggets here. The overall result is an uplifting and beautiful book.